Last Sunday Ajax fought against Feyenoord at De Kuip, home stadium of the opponent. As you have already heard from the news, Ajax lost 2-4 and they still sits forth in the league table. Eriksen's first goal was excellent, and he showed his wonderful passing and dribbling skills throughout the match. But most of the players played poorly and I must admit that they deserved the loss. By watching this historic national derby, I figured out two problems of the team, both in terms of the tactics of the team and the quality of players. Anita and Blind were on the starting line-up. At the beginning of the season, Van der Weel and Boilessen played at side backs, but they were not available due to injury in the last match. Anita and Blind are both talented side backs who have featured the Dutch youth national teams. Anita can run around the pitch throughout 90 minutes, and Blind has good technique and can provide good short passes to the midfielders and attackers. The problem is their long-range passes. Anita and Blind are good at positioning when receiving the ball among the defense line. However, they are not very good at building attacks by providing middle- to long-range passes to the attackers, failing to make smooth transitions from defense to attack. Other side backs, Boilesen, Van der Weel and Ligeon all have the same problem. They have certain advantages, such as dribbling and crossing skills (Ven der Weel), speedy and powerful over lap run (Boilesen), etc, but the lack of good vision and long-range passing skills is the single disadvantage they all share. In the last Sunday's match, center back Vertonghen was the only one in the defense line who could provide long passes to the attackers. So Ajax heavily depend on the center backs in building attacks. In my view, offensive midfielder Janssen was aware of this problem, and he tried to build attacks backwards by often playing in the defense line. However, Janssen himself was not in good form and the effort basically ended in vain. Normally, such a role should be played by a player at the anchor in midfield. So I understand why coach De Boer placed Janssen at the defensive midfielder at the beginning of the season, though I know that there was much criticism about this formation. Current anchor Enoh is a good disciplined defensive midfielder, but his vision is not top quality. 2. Space between midfielders and defenders. This has been a problem since the beginning of the season. Ajax use a 4-3-3 formation, with one defensive and two offensive midfielders. In this tactics, the offensive midfielders are not required to contribute to defense, and the defensive midfielder (Enoh) has to cover wide space in front of the defense line. Ajax use zonal defense, so when an opponent offensive midfielder is in front of the defense line, it is always the anchor's role to mark him. The two central defenders always make a line and never put themselves back and forth. So what happens in this situation is that when an opponent winger holds the ball and make a cut-in, Enoh cannot deal with him because he has to mark another midfielder instead of one of the two center backs. It might be Janssen, Blind or Enoh who has to play the ball, but it's just unclear who is in charge of this. This is due to the traditional style of Dutch football. They don't like to change their positions. 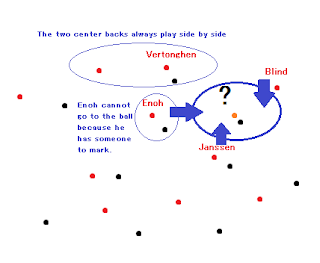 In the above chart, if Enoh plays the ball, somebody else (probably one of the center backs who doesn't have any opponent to mark) has to mark the opponent who has been in front of Enoh, and instead, the right side back has to play as a center back, making a temporally three-back formation with two defensive midfielders (Enoh and one more). Otherwise, Janssen or Erikssen has to get back and play as a defensive midfielder. But they simply do not do this because they want to attack in a 4-3-3 formation. Changing positions when in defense also means changing positions when they regain possession. Alright, this is my analysis of the current problems of the team. I would like to turn to transfer news. Ajax did not sign any new player in the January transfer market. This is considered to be a big failure considering the current position of the team in the league table. Transfer news around Ajax can be summarized as follows. Bouy, who never made his Eredivisie debut but was considered to be one of the most promising young players from the Ajax youth academy, moved to Juventus on a 3.5 year contract. El Hamdaoui was about to leave Ajax for Fiorentina, but the negotiation collapsed. He has not played Eredivisie matches since April because of his bad attitude. Ajax failed to sign Heerenveen's winger Narsingh. Heerenveen's side back Janmaat, who was targeted by Ajax, will move to Feyenoord this summer. OK, so there will be no new faces in the squad, and Ajax failed to make financial resources to sign new players in the next transfer market... I wanted to see new side backs or wingers because many players are injured now, but they were too slow to make an action. Indeed, Narsingh later expressed his willingness to join Ajax, but it was not before the deadline of the market when Ajax officially tried to sign him. Well, everything could happen in this transfer market, even on the final day, but if they wanted to be a stronger team, I think they should have made earlier actions. Bouy's departure was a sad thing for Ajax fans, but I wish him all the best in one of the most famous teams in the world. Due to the shortage of field players, assistant coach Dennis Bergkamp, former legendary striker of the Dutch national team, joined the training.